Hey Roadies! Did you make a resolution to be more creative this year? How's that going for you? It's hard to believe we are embarking on the third month of the year already! We know how difficult it can be to find creative time, that's why we love to make it easy for you by putting together fabulous kits to inspire you! Beside inspiration, these kits provide you with carefully curated product that is designed to mix and match beautifully. Today we have two sneak peeks to share with you of our latest kit! It's called Vintage Beauty and there's definitely a reason for that! It is a stunning mix of pattern and color and fabulous product and we can't wait to share it with you. This kit is a mini album kit which means it is designed to create a mini album. It includes a lovely chipboard mini as part of the kit. But even if you don't scrapbook, you'll find this kit is an amazing deal and full of products you can use to create cards, altered projects or even a banner. 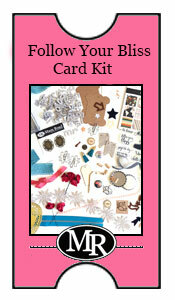 This kit has a lot of stunning embellishments in it and a mix of brand new product from Maya Road. Check out that darling saffron tassel! Each Maya Road kit also has exclusive product in it that you won't find anywhere else! Vintage Beauty has some gorgeous custom flair buttons that add color and style to the kit as well as other special embellishments. 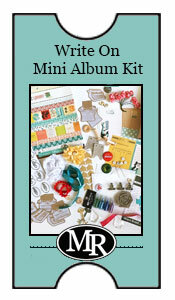 Stay tuned throughout the week as we share fabulous peeks and more info about the Vintage Beauty Mini Album Kit! It's coming soon!